As squash is the perfect sport for a workout and can be played no matter the weather, it is a very popular game within Nomads. It has also a very active section. There are great advantages to becoming an active member of the section. The fact is, that not only do you get to meet a lot of interesting people; you can participate in continually rotating leagues. There are a number of leagues, each reflecting a different standard of play. Over a period of a few weeks, each player, having been given the full contact details of all in his or her league, contacts them and arranges a mutually suitable date and time to play their game. Results are recorded and tabulated, and at the end of the period, the one at the top of each league is promoted, while the one at the bottom is demoted. This means that all games played are challenging, but fair. 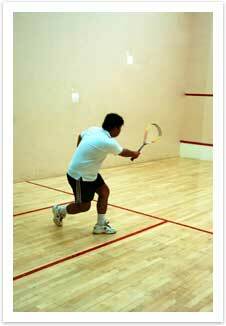 The Squash Section also organizes an open competition once a year when some of Manila's best compete. Occasionally, inter-club competitions are also arranged, or members participate in other clubs events. For those who believe their game needs improving, the club has a professional coach who can be hired for lessons or advise.